Models of Journalism investigates the most fundamental questions of how journalists can best serve the public and what factors enable or obstruct them in doing so. 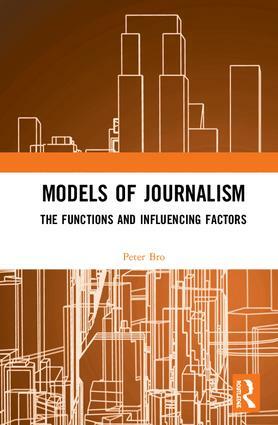 The book evaluates previous scholarly attempts at modeling the function and influencing factors of journalism, and proceeds to develop a range of important new models that take contemporary challenges faced by journalists and journalism into account. Among these new models is the "chronology-of-journalism", which introduces a new set of influencing factors that can affect journalists in the 21st century. These include internal factors – journalistic principles, precedents and practices – and external factors – journalistic production, publication and perception. Another new model, the "journalistic compass", delineates differences and similarities between some of the most important journalistic roles in the media landscape. For each new model, Peter Bro takes the actions and attitudes of individual journalists as its starting point. Models of Journalism combines practice and theory to outline and assess existing theoretical models alongside original ones. The book will be a useful tool for researchers, lecturers and practitioners who are engaged with the ever-evolving notions of what journalism is and who journalists are. Peter Bro is Professor, PhD and Director of the Centre for Journalism at the University of Southern Denmark. He is a board member of several journals and media companies and writes widely within the field of journalism, media and communication studies.